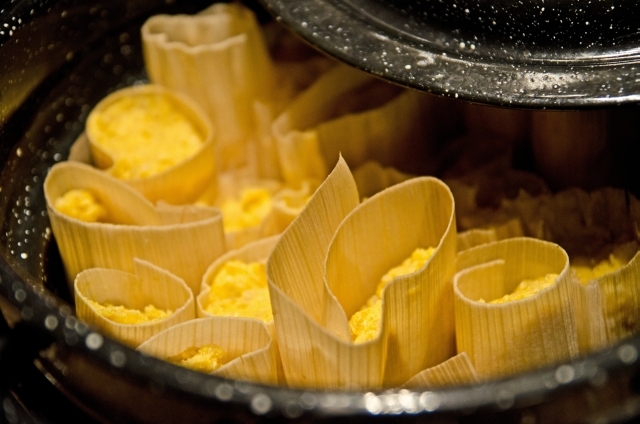 South American tamales are mostly masa served with delicious sauces, whereas Central American tamales rely on stewed meats and veggies to add flavor. This recipe is more in a South American style but uses Kabocha, a Japanese winter squash, to add substance and sweetness. Any winter squash, like butternut or acorn, will make a good substitute. Steam the tamales until the masa is firm, about 20-30 minutes. Serve with your favorite Aji.